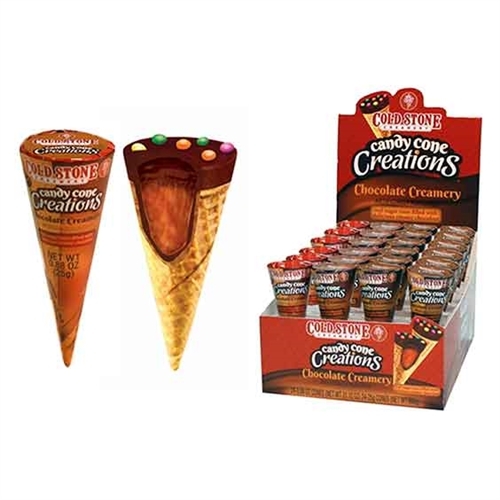 Cold Stone Creamery Candy Cone Creations Chocolate Creamery real sugar cones filled with delicious creamy chocolate. 24 - 0.88 oz Ice cream sugar cones are in each store counter display. Average Customer Review: 2 of 5 Total Reviews: 1 Write a review to tell others what you think about this item. I ordered 2 boxes of the Stone Cold Creamery candy cone Craze , I previously have tasted these and ordered them from a different place . But sadly ,this shipment had a very Stale appearance as well as they tasted stale . The Center was Not creamy, All of the chocolate in the cone was very hard and Most had white spots . I had many compliments from customers.